MXMJOY's (formerly known as Maximum Joy) London show, originally set to take place this Friday at Total Refreshment Centre, will now go ahead at Moth Club, also in Hackney. The move comes after Hackney Council last month issued a notice of closure. A spokesperson for Hackney council said that the premises had been issued the notice and was being investigated following allegations that it was "selling alcohol and playing music without the relevant licences". The order was issued to Total Refreshment Centre on June 16. Events set to take place that weekend were cancelled and ticket holders received refunds. Speaking with The Quietus, a representative for Total Refreshment Centre said gigs would be discontinued for an indefinite period, but that the music studio, workshop and gallery spaces would continue to operate. The venue, on Foulden Road in Dalston, is in a residential area. 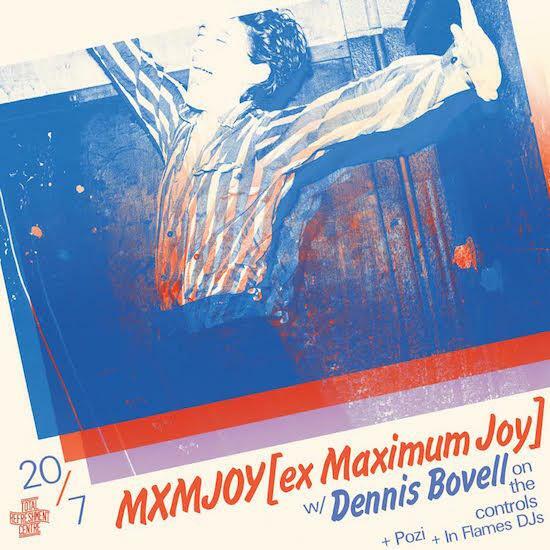 The MXMJOY gig, going ahead at Moth Club, will feature a performance from the group, mixed live by musician and dub producer Dennis Bovell. Support will be provided by London punks POZI. You can find tickets here. "We're working on getting a new premises license sorted as well as drafting plans for the space, there are quite a few exciting ideas brewing," says a representative for Total Refreshment Centre. "Once the plan is hatched, we'll reach out to our community with these ideas to see who wants to get involved, we're seeing this hick up as an opportunity to develop more side activities that focus more deeply into celebrating culture and the community around us. I believe there will something of interest for everyone in this plan." The venue is seeking empty spaces to host replacement, and newly-booked, gigs allowing them bring in their existing infrastructure while the venue is not in use. "We're not really interested in just being a traditional promoter, the curation and helping the creation of fresh new material and showcases is where our heart is at right now," their statement continues.